These polychora belong to the ondip and gondip regiments. Ondip is the uniform polychoron resulting in blending four sidpiths together and gondip is its conjugate (blending 4 quidpiths). There are ten known scaliforms in each regiment plus three fissaries (some members are "almost in" the regiment though due to some absent edges). These have 128 vertices and their verfs are blends of two various verfs amongst the sidpith (gittith for gondip) regiment. This regiment acts similar to the idcossids. Four of these have octagon2 symmetry (sisoxdip, sisocaxdip, gisoxdip, and gisocaxdip), while the rest of them have anti-square2 symmetry. I found these in mid-March 2006, not long after Mason Green found ondip. The fissaries were found and all of these were named when I typed up this page on March 10, 2012. These are in (or almost in) the ondip regiment. Sisoxdip - (sis OX dip / small stelloctagonal expandiduoprism) - cells are 64 tets and 16 socco-tepcus blends. This one is formed by blending 2 steths and 2 shados. It is orientable and tame. Sisocaxdip - (SI so CAX dip / small stelloctagonal cubiexpandiduoprism) - cells are 32 cubes (doubled like 8/2 prism), 64 cubes, and 16 sroh-topfu blends. This one is formed by blending 2 cacos and 2 sniptos. It is non-orientable and wild. Sadiscagop - (sa DIS ca gop / small disquare cubantigrand prism) - cells are 64 tets, 64 trips, 16 cubes, and 16 sroh-socco blends. This one is formed by blending 2 steths and 2 snappoths. It is non-orientable and wild. Sadiscus Cagop - (sa DIS cus CAG op / small disquare cubisnub cubantigrand prism) - cells are 32 tets, 16 cubes, 32 cubes, and 16 sroh-socco blends. This one is formed by blending 2 steths and 2 sniptos. It is non-orientable and wild. Sidsdipcus Cagop - (sids DIP cus CAG op / small disquare disprismatocubisnub cubantigrand prism) - cells are 32 tets, 128 trips, 16 cubes, 32 cubes, and 16 sroh-socco blends. This one is formed by blending 2 snappoths and 2 dippits. It is non-orientable and wild. Sadspacus Cagop - (sad SPACK us CAG op / small disquare prismatocubisnub cubantigrand prism) - cells are 64 tets, 64 trips, 48 cubes, and 16 tepcusses. This one is formed by blending 2 steths and 2 iquipadahs. It is orientable and wild. Sidsadip Cusagop - (SID sa dip CUSE a gop / small disquare disprismatocubisnub antigrand prism) - cells are 64 tets, 128 trips, 32 cubes, and 16 topfus. This one is formed by blending 2 snappoths and 2 iquipadahs. It is non-orientable and wild. Sidsadcuscagop - (sid SAD cus CAG op / small disquare dicubisnub cubantigrand prism) - cells are 32 tets, 16 cubes, 64 cubes, and 16 sirco-topfu blends. This one is formed by blending 2 scucoths and 2 sniptos. It is non-orientable and wild. Sidsposagop - (sid SPOSS a gop / small disquare prismatosnub antigrand prism) - cells are 32 tets, 64 trips, and 16 sirco-tepcus blends. This one is formed by blending 2 steths and 2 cacupos. It is non-orientable and tame. Sidspacusagop - (SID spa CUSE a gop / small disquare prismatocubisnub antigrand prism) - cells are 32 tets, 64 trips, 32 cubes, and 16 sroh-topfu blends. This one is formed by blending 2 cacos and 2 snappoths. It is non-orientable and wild. Sofidspacusagop - (so FID spa CUSE a gop / small fissary disquare prismatocubisnub antigrand prism) - cells are 32 tets, 64 trips, 32 cubes, and 32 2-squicu blends (paired). This one is formed by blending 2 stefacoths and 2 shafiptos. It is fissary, non-orientable and wild. Sofidspid Cuscagop - (so FID spid cus CAG op / small fissary disquare prismatodicubisnub cubantigrand prism) - cells are 64 tets, 64 trips, 16 cubes, 64 cubes, and 32 squicus (paired). This one is formed by blending 2 sidpiths and 2 scucoths. It is fissary, orientable and wild. Sofidsdip Cuscagop - (so FIDS dip cus CAG op / small fissary disquare diprismatocubisnub cubantigrand prism) - cells are 32 tets, 128 trips, 16 cubes, 32 cubes, and 32 squicus (paired). This one is formed by blending 2 sidpiths and 2 cacupos. It is fissary, orientable and wild. These are in (or almost in) the gondip regiment. Gisoxdip - (gis OX dip / great stelloctagonal expandiduoprism) - cells are 64 tets and 16 gocco-chag blends. This one is formed by blending 2 gittiths and 2 gahdos. It is orientable and tame and it's verf is convex. Gisocaxdip - (GI so CAX dip / great stelloctagonal cubiexpandiduoprism) - cells are 32 cubes (doubled like 8/2 prism), 64 cubes, and 16 groh-tustopfu blends. This one is formed by blending 2 gacos and 2 gniptos. It is non-orientable and wild. Gadiscagop - (ga DIS ca gop / great disquare cubantigrand prism) - cells are 64 tets, 64 trips, 16 cubes, and 16 groh-gocco blends. This one is formed by blending 2 gittiths and 2 gnappoths. It is non-orientable and wild. Gadiscus Cagop - (ga DIS cus CAG op / great disquare cubisnub cubantigrand prism) - cells are 32 tets, 16 cubes, 32 cubes, and 16 groh-gocco blends. This one is formed by blending 2 gittiths and 2 gniptos. It is non-orientable and wild. 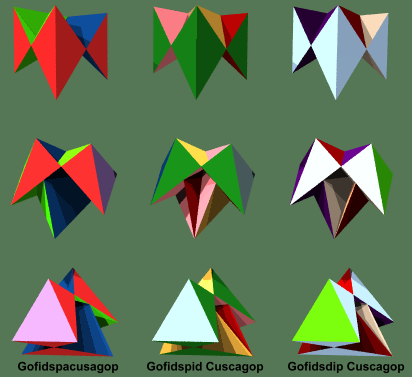 Gidsdipcus Cagop - (gids DIP cus CAG op / great disquare disprismatocubisnub cubantigrand prism) - cells are 32 tets, 128 trips, 16 cubes, 32 cubes, and 16 groh-gocco blends. This one is formed by blending 2 gnappoths and 2 picnuts. It is non-orientable and wild. Gadspacus Cagop - (gad SPACK us CAG op / great disquare prismatocubisnub cubantigrand prism) - cells are 64 tets, 64 trips, 48 cubes, and 16 chags (cross-hatch gocco). This one is formed by blending 2 gittiths and 2 gaquipadahs. It is orientable and wild. Gidsadip Cusagop - (GID sa dip CUSE a gop / great disquare disprismatocubisnub antigrand prism) - cells are 64 tets, 128 trips, 32 cubes, and 16 tustopfus (2 stop fusion). This one is formed by blending 2 snappoths and 2 iquipadahs. It is non-orientable and wild. 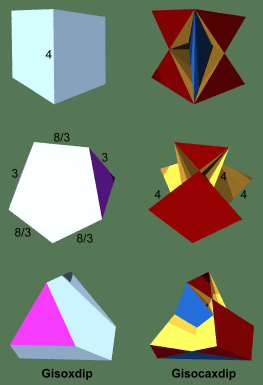 Gidsadcuscagop - (gid SAD cus CAG op / great disquare dicubisnub cubantigrand prism) - cells are 32 tets, 16 cubes, 64 cubes, and 16 querco-tustopfu blends. This one is formed by blending 2 gacucoths and 2 gniptos. It is non-orientable and wild. Gidsposagop - (gid SPOSS a gop / great disquare prismatosnub antigrand prism) - cells are 32 tets, 64 trips, and 16 girco-chag blends. This one is formed by blending 2 gittiths and 2 gacupos. It is non-orientable and tame. Gidspacusagop - (GID spa CUSE a gop / great disquare prismatocubisnub antigrand prism) - cells are 32 tets, 64 trips, 32 cubes, and 16 groh-tustopfu blends. This one is formed by blending 2 gacos and 2 gnappoths. It is non-orientable and wild. Gofidspacusagop - (go FID spa CUSE a gop / great fissary disquare prismatocubisnub antigrand prism) - cells are 32 tets, 64 trips, 32 cubes, and 32 2-rasquacu blends (paired). This one is formed by blending 2 gittifcoths and 2 gahfiptos. It is fissary, non-orientable and wild. 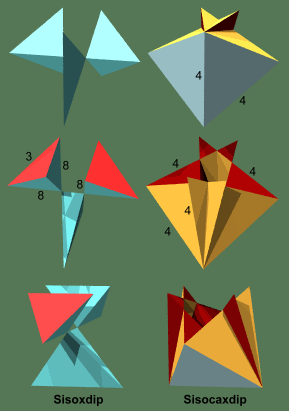 Gofidspid Cuscagop - (go FID spid cus CAG op / great fissary disquare prismatodicubisnub cubantigrand prism) - cells are 64 tets, 64 trips, 16 cubes, 64 cubes, and 32 rasquacus (paired). This one is formed by blending 2 quidpiths and 2 gacucoths. It is fissary, orientable and wild. 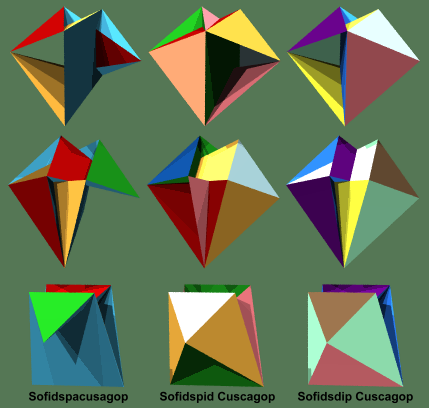 Gofidsdip Cuscagop - (go FIDS dip cus CAG op / great fissary disquare diprismatocubisnub cubantigrand prism) - cells are 32 tets, 128 trips, 16 cubes, 32 cubes, and 32 rasquacus (paired). This one is formed by blending 2 quidpiths and 2 gacupos. It is fissary, orientable and wild. The following are conjugate pairs: swap first letter "s" - "g", i.e. sisoxdip-gisoxdip.